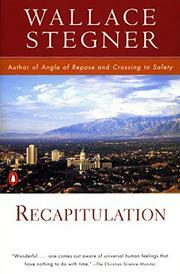 Bruce Mason, a retired career diplomat, returns to the site of his boyhood, Salt Lake City, to bury an elderly aunt. "He feels the whole disorderly unchronological past hover just beyond the curtain of the present, attaching itself to any scent, sound, touch or random word that will let it back in." Wandering the streets, he hauls back memories of his long-suffering mother and his hated bootlegger father. His sexual frustrations, his friendship with his only true pal, a romance with a Mormon girl, Nola--all borne in upon him in strongly etched waves. Stegner is nothing if not a sturdy guildsman: he makes a book with strong ribs, even if, as here, the meat is rather skimpy. The scenes, though, of Utah natural beauty are evocative and visual; Bruce's coming-to-terms with his dead, detested father also is effective. But more than the memories themselves, which are basically undramatic and recessive, Stegner's cool-handed assurance--and his heightened visibility as a National Book Award winner--will reach out to those earnest readers who are able to derive substantial pleasure from mild, quiet, competent work.